1. Marketing Communications: Past and Present. 2. Communications Theory. 3. Buying Behaviour. 4. Image & Brand Management. 5. Marketing Communications Planning. 6. Understanding Marketing Research. 7. Target Marketing. 8. Campaign Tactics and Management. 9. Advertising. 10. Sales Promotion. 11. Public Relations. 12. Sponsorship and Product Placement. 13. Direct Marketing and E-Commerce. 14. Personal Selling, Point-of-sale and Supportive Communications. 15. Integrated Marketing Communications. 16. Internal Marketing. 17. Marketing Channels and Business to Business Communications. 18. Ethical Marketing and the Regulatory Environment. 19. The Communications Industry. 20. Global Marketing Communications. 21. The Changing Face of Marketing Communications. 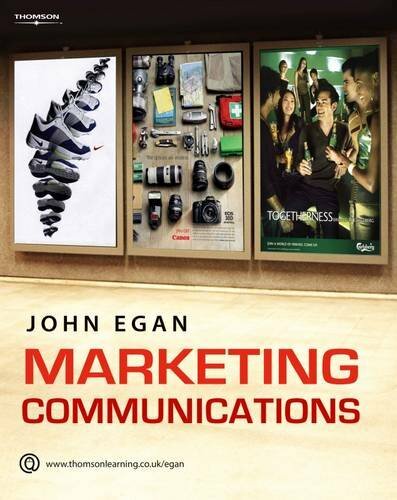 "Marketing Communications" blends inspired examples with wide-ranging theories and applications to provide a complete introduction to this popular subject. Drawing on years of experience in both industry and academia, John Egan provides a fresh approach backed with numerous industry examples. All aspects of modern Marketing Communications are covered, including 'Communications Theory', 'Advertising', 'Sales Promotion', 'Planning', 'Research' and 'Public Relations' through to rarely covered topics such as 'Internal Marketing', 'Ethical Marketing' and the 'Regulatory Environment'. The concluding chapter on 'The Changing Face of Marketing Communications' sets the scene for future developments while detailed further reading and references provide pathways for advanced study. Mini Case Studies in every chapter mix theory with practice while longer end-of-chapter Case Studies with questions summarise student learning within a real-world context. European examples and rich pedagogical features, including learning objectives, review questions and large colour illustrations, ensure students will relate seamlessly with the ideas presented. This dynamic text is ideal for all students studying Marketing Communications, particularly those on undergraduate, postgraduate and Professional Diploma courses.